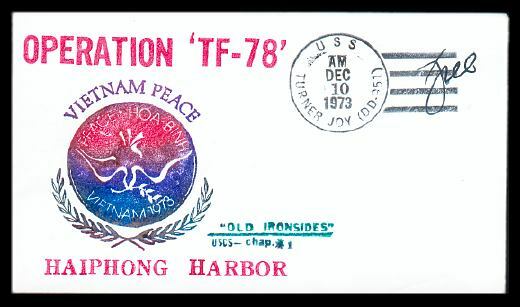 A free-franked commemorative cover, prepared on the American destroyer Turner Joy in late December, 1973, serves as an ironic reminder of that ship's role in the beginning of the Vietnam War. 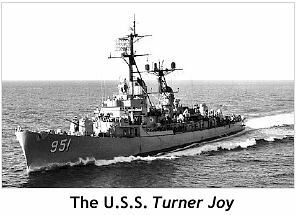 On August 4, 1964, the Turner Joy (DD-951) was patrolling off the coast of Communist North Vietnam when radar indicated that North Vietnamese gunboats were attacking it and another American ship, the U.S.S. Maddox (DD-731). The Maddox had been involved in a similar incident the day before, when it was struck by North Vietnamese shells, but there was never any concrete evidence that the Turner Joy had been attacked. The next day, the New York Times reported in a front page article that President Johnson had ordered retaliatory action against gunboats and “certain supporting facilities in North Vietnam” after “renewed attacks against American destroyers in the Gulf of Tonkin.” That "retaliatory action" soon escalated into the quagmire of the Vietnam War. In the next nine years, more than 47,000 Americans would die in combat, millions of Vietnamese would lose their lives, and the Communists would ultimately win the war. By 1973, when the cover shown below was mailed, the Vietnam War had fragmented the American people into violent pro- and anti-war factions and had forced Lyndon Johnson out of office. Newspapers around the world had headlined the infamous My Lai Massacre, the Kent State shootings, "fragging" of American officers by their own men, body counts, the courageous but ultimately pointless battles of Khe Sanh and Hamburger Hill, the self-immolation of monks and even an American Quaker, and the summary executions of Viet Cong suspects and sympathizers. The words "Operation TF-78" stamped on the cover refer to the "Mine Countermeasures [Task] Force," which in 1973 cleared American mines from Haiphong Harbour, in accord with an agreement reached by peace negotiators in Paris. The Turner Joy supported the task force. Although the cachet expresses a wish for peace, Americans would be involved in combat in Vietnam for another 17 months.